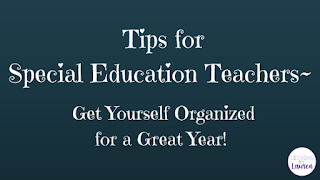 Special Education Teachers - Get Yourself Organized for a Great Year! Special Education teachers wear so many hats and are pulled in so many directions each and every day. I'm a Resource Room teacher (working with 3rd, 4th, and 5th graders) and I do a little bit of everything - teach small group reading, math, and writing groups, push-in to classrooms and consult/co-teach, help students with organization and study skills, provide testing accommodations, help students initiate and complete assignments, create (and monitor) behavior plans, monitor progress of IEP goals, write IEPs, consult with classroom teachers and related service providers, communicate with parents - and so many more things. There is so much going on each day, that it's really important to stay organized. 1. Get to know the general education teachers, related service providers, and aides you will be working with. It's really important that you're all on the same page about your students. Find out what the best way will be to communicate with them. I love to e-mail as I tend to work with at least 5 classroom teachers (some years closer to 10 by the end of the year) and multiple related service providers, and often, our schedules are very different. It's hard to touch base with all of them daily or even weekly sometimes, so I find e-mail works best for me. However, it's really important to see if that works for the other teachers/providers - some may never check their e-mails, so you'll have to find another way, such as stopping by their rooms before or after school, eat lunch together, or try to find a rare free moment! 2. Read your students IEPs over and over - and make sure you know them well! I usually read through the IEP once to get the big picture of a student, then read through it a second (and third and fourth) time and take notes. 3. Make cheat sheets for yourself and the general education teachers. I like to call them cheat sheets, but really it's a quick reference page so you don't have to constantly flip back through all the IEPs every time your students take a test. I make a few different cheat sheets. I like to make class (or grade) reference pages - one with all the services the students will receive, one with all the testing accommodations, and one with all of the program modifications. I also make a reference page for myself with the goals for the students in each group; this helps to keep me more organized as I lesson plan and/or give progress monitoring tasks. 4. Decide what organization system works best for you. There is a TON of documentation and paperwork in special education. I like to keep all of my IEPs in one binder, with a section for all of my cheat sheets. I have another binder (or two) with all my progress monitoring; each student has a section for his/her goals. Also, each student has a folder in which I keep any other documentation, notes from parents and other teachers/service providers, and work samples. 5. Schedule your students. I've worked in some districts where the scheduling is done for you (I've found this usually is only for middle and high school school though!). I do all my own scheduling at my school. Working with three grade levels makes scheduling quite a challenge at times. I like to sit with a spreadsheet (that is divided into 5, 10, or 15 minute intervals) and try to make it all fit! In a perfect world, I would try to group by ability level/goals, but with limited time, I often have to group by grade and then subject focus (ELA, Math, organization, etc.). Even that can be a struggle. Also, talk to your administrator (and check the IEPs! ), to see if you will be supplementing or replacing instruction. This will really help with scheduling as you wouldn't want to pull students out of their classrooms for ELA support during their math time. Or, if you're supposed to be supplementing ELA, you wouldn't want to take them out during their ELA time as that would be replacing their instruction. Also, it's really important to find out when the students will be receiving any related services - I like to make myself a schedule for each class I work with so that I can see where the students on my caseload are at any time, what subjects they are missing because they are pulled out for something else (and thus many need additional help with later), and to ensure that they are receiving everything listed on their IEP. After scheduling with classroom teachers and service providers, I like to make a little card for each student's desk so they know when they should come to my room. The first few weeks, I usually end up going to each classroom to get them until they are in that routine. Then, they can use the card on their desk to remind themselves of when to come. Other suggestions are to have class buddies remind each other or to call the classroom and hang up after one ring. 6. Set up a group behavior system. I've worked with some groups that are so well behaved that they never really needed anything. However, these groups are usually pretty rare! Plus, even the best behaved kids deserve positive feedback! When I was teaching middle school, I always used a check system with my students. They would earn points for completing their work, showing good behavior, staying on task, etc. At the end of the week, I would give them a "paycheck." They would then balance their checkbooks. On Fridays, if they earned a certain amount of money, they would have some free time and could also "buy" certain items/privileges. This system worked so well - especially for my challenging 8th graders! I've also used it with upper-elementary kids too. You can check out this resource here. 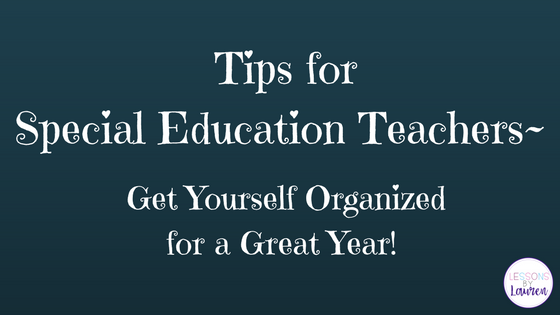 Being a special education teacher is hard work - but keeping organized can definitely help to manage everything. What other tips do you have to set yourself up for a successful year? Share below! Should you introduce flexible seating? How to find the right preschool curriculum? August ~ Right Here, Right Now! ~ A New Link-Up! Fostering Team Building and Creative Thinking! Fun Apple Ideas & a Freebie!